Place the biscuit in a medium bowl and drizzle over the whisky. Place the chocolate and oil in a large bowl and mix to combine. Set aside 1 cup (150g) of the chocolate mixture. Add the clementine, almond, marshmallows and the biscuit mixture to the large bowl and mix to combine. Spoon the mixture into a lightly greased 20cm x 30cm slice tin lined with non-stick baking paper. Gently tap the tin and smooth the top. Pour over the reserved chocolate and smooth to an even layer. Sprinkle with the extra almond and refrigerate for 30 minutes or until set. 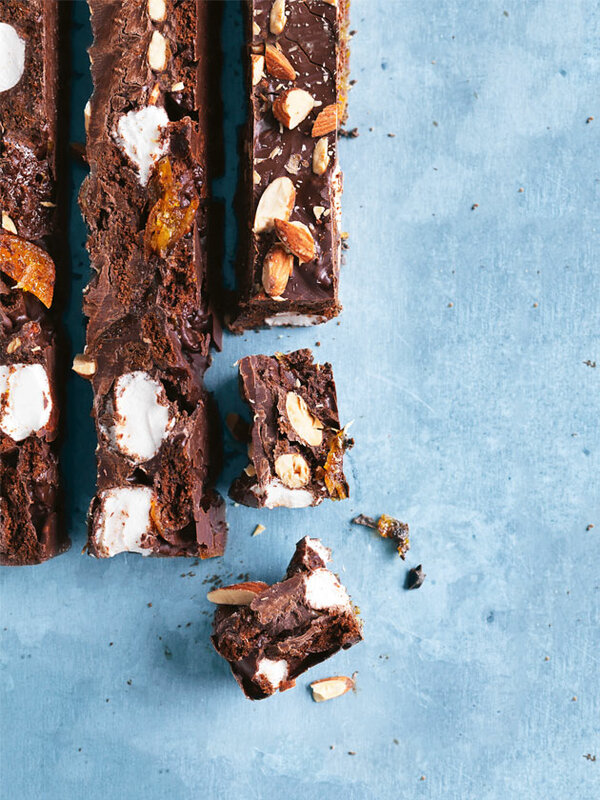 Cut the rocky road into bars to serve. Serves 24. + You can store this rocky road in a cool, dark place for up to one week.